Will your class escape in time? Try this escape room style game with your students today! This is a fun game that is perfect for reviewing main idea and details. **This game is designed for upper elementary. The clues and puzzles are more intense, and the reading passages are 3 paragraphs, as opposed to one. This is an interactive game where the students are timed. They are trying to save a museum that has been robbed of all its ancient artifacts. Students must solve a string of questions and clues, as well as decode different ciphers. If your class has never played an escape style game before, I suggest playing this as a whole class. However, materials are provided for up to 6 different groups to play at one time. Students try and solve clues and questions to breakout and escape the classroom. You, the teacher, can decide how much time your students have to complete the task. I suggest 45-60 minutes, but it is up to your discretion. You can project a timer for your class, or put one somewhere for all the students to see, so they can keep track of how much time they have left to complete their task. I love all of your Escape the Rooms. The students love each and every one we have done at school. Directions were easy to follow. My kids loved this activity! Love this and can’t wait to use it! My students LOVED this! I have done previous classroom escape type activities and they were able to complete the tasks too fast, but not this one! Kept my students engaged and they had a blast! Super fun though time consuming set up. All set up and ready to go- will be lots of fun! My kids loved this! Lots of time to prep, but great resource! My students loved this activity! Thanks! I think this will be a great way to get students excited about a difficult concept! Fun way to teach this concept! Perfect for our early release Friday! My students had a blast with this and learned in the process. Great product! This activity was amazing! My third graders loved it! It was such a great way to get them moving around the room and interacting with friends! Students loved the hands on activity to use as review, such a wonderful break for all from the regular review worksheets! Such a great resource! My students loved this and it was easy to use!! Thanks so much! Great resource! Absolutely love these resources, and so do my students! Very good!! We had fun! I loved the museum theme for an escape room! Can’t wait to use this resource this year! I love this product. SO engaging!!! My students enjoyed this. Previously, we had just done the math crack the classrooms. I did find that the students needed more time with this than the math versions, so next year I will allocate more time for them to complete it. Thank you! I love the resources that you have created. Thank you! This was an excellent supplement for my main idea lessons! My class loved this! Thanks! WOW! This is a phenomenal resource. It is outstanding and so easy to follow. Thanks! SO cute! I first saw something similar to this being done at The Ron Clark Academy and the kids were so involved! I’m stoked to integrate it into my center time for the upcoming school year! This was such a fun game for my students. I can’t wait to use it this year again. This is an AMAZING product! I can’t wait to use this with my students this year:) Thank you for this well thought out product! This was a great way to review and practice reading comprehension before our state tests. My students were engaged the whole time! My students had a lot of fun with this activity! I loved seeing how engaged my students were while completing the activities in this set! I will definitely be purchasing additional sets. Thank you! Such fun! The kids love these! I have several of these and love them! Such a great way for students to practice what they have learned. This would have been fun for me as a student. Gets the kids up and moving! Highly recommend this resource! Engaging, fun, and 5th grade appropriate. This will make learning about main idea so much better. My students loved doing this! My kids love doing these! We had so much fun with this activity. The students couldn’t wait to get started! I can’t wait to use this with my class!! Thank you!! My kids LOVE these escape room activities! This was a fun activity. This is fantastic! The amount of effort is noticeable and the quality of the product is superb. Very engaging! A lot of prep, but well worth it for the fun my students had working on this! So much fun! I teach 2 sections of reading and I made it a competition between classes. I know this activity will be a fantastic culminating activity. Looks so fun, I can’t wait to try this! My kids LOVED this! Thanks! This is going to be so much fun!!!! Love your detailed instructions!!! Thank you! My students were SUPER excited to do this activity, but the prep work is SO much time AND paper! Thank goodness I have several TAs! I also laminated many pieces so that I won’t have to put in so much time and energy again. However, for the level of creativity and the price, it was worth it. My kids loved this resource! This looks great and I’m so excited to use this in the classroom this year! This activity was engaging but did involve some time to prepare. Students learned about many landmarks as well as interesting facts in the main idea/detail portions of the activity. Great way to review important skills! Used this for Spy Day. LOVE these products! Such a fun way to review this skill! Totally worth the effort of putting it together. My students loved this so much and asked if we could do more in the future. It was a LOT of work on my part, but I can reuse it in the future so that’s good! This year instead of parties for the holidays we did “Crack the Classroom” and STEM activities. These were perfect for days right before a break when you are trying to fill the time! Great review skills and lots of fun!! This is so much fun! My students absolutely loved it; they were engaged the whole time! It took longer than anticipated, but they were so focused and engaged that it didn’t matter. Even though this took a lot of planning, I will definitely be using this and purchasing others in the near future! My kiddos LOVED this and begged for more! Great product. . . however, I found it very time consuming to create/utilize. Thank you. Thank you! This is perfect, especially as a first one for students. We had a blast! So fun! I can’t wait to use this again! This was a great resource! The kids loved it! Had so much fun with this activity. Thanks!! Fun way to reinforce concepts and get the kids moving. Very fun for my students. This will be a fun activity to use with my students! This was a great review activity for the end of a unit or the end of the year. My students had a lot of fun. Thank you for such an easy, no-prep, and thorough resource! Love these review activities and love the price. I plan on using this resource toward the end of the year for review since I teach third grade. Really great resource – my class are so keen to complete these cracking the codes. So thorough and well thought out. My kids LOVED this!!! Thank you! Students are having so much fun they don’t even realize they are learning. Great resource and great instructions to help put it together! It was hard for me to figure out! But once I did, it was a great activity for my class. Love love love love these activities ! My students LOVED feeling as if they were traveling around the world with this review! It took a lot of time to set this up, but I know from doing other Escape activities, the first time is the hardest. Students enjoyed it! A student answer sheet would have been helpful. I just have to make sure to find the time to plan this in the lessons next year! Such a fun way to practice main idea and details! We had a blast! Thanks! Your pictures were so helpful to put this together step by step because I was a little nervous at first. Doing this with my class next week. Can’t wait! This did take a little more prep than I realized it would, but otherwise it was really nice. My kids enjoyed their first escape room and seemed to really get the concepts that we had been working on. My kids really enjoyed trying to solve the riddles. Students were unclear about which envelope to begin with in step one. They enjoyed solving the clues and searching for the next clue. Enjoyed the reading skill focus. My students are so excited to do this for the last week of school! My students LOVE these breakouts! Thanks! My students loved this! I do have to say, it took longer than expected and suggested, but it may have been because it was the first time we had done an activity like this. Looking forward to using this in the fall! The directions were not very clear with setting up the challenge. So fun! The kids were really engaged. Loved this! The kids were so excited to complete this and they were using thier reading skills the whole time. A lot of work putting it all together, but worth it in the end! The kids loved it. My students were so engaged and love this! Your escape rooms are AMAZING! I’m sure I’ll own most of them soon enough! My students love crack the code! They are very engaged and don’t even realize they’re working! This is amazing!!! My kiddos loved it!! Very clear and easy to set up – the kids LOVE these activities! The resources are very well laid out and the ease of use is great. I’m excited to do this escape room with my students tomorrow. This is a skill they have the most difficulty with and I think it will be a fun review prior to our state testing. Kids had a blast with this activity! Super engaging and entertaining. Awesome activity. The kids loved it! Can’t wait to use this with my students!! My students LOVED this activity and asked for more activities just like this! Thank for a well constructed and in depth product! I am totally going to do this with my students as soon as testing is over! Great resource, but definitely takes longer than the 45 suggestion. I was looking for a creative way to incorporate technology in my teaching, and the QR code version of this escape room, allows me to do so. Lots of prep, but fun for kids! My students loved this and keep asking to do more! Students LOVED this! Fun way to review! This is a lesson that needs to be prepped in advanced, but it was so worth it! We did this after standardized testing and was a big hit with the kids! Excited to give this a try next school year! Fantastic resource! Engaging, fun, and educational! After reading reviews I knew it would take a bit longer to put together which I had no problem with! My kids had a blast with this as we reviewed for our state test! Now that it is set up I am for sure going to use this for years to come! I love it! Loved the challenge it provided for my students! This is so wonderful! I love using escape rooms for my students. It really promotes perseverance and self-learning. Thank you for the wonderful product! Great product to use as a review. I used it in one of my intervention groups. My students struggled with completing the task in under 1 hour (2 sessions). Took us 3 days to complete. Overall, students were actively engaged and excited to do the activities. I can’t wait to try this with my students. They have all loved the other escape rooms I have purchased from you, so I’m sure they will enjoy this one, too! My students love your escape rooms! Thank you for a great resource! This is my second one. Love them! I used this during my intervention group! The kids loved it! I can’t wait to use this with my kiddos next week! 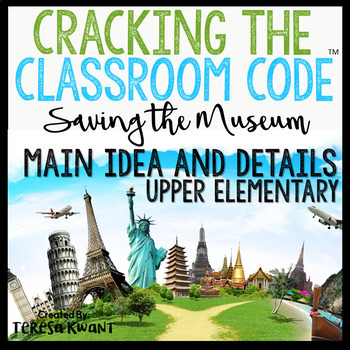 I LOVELOVELOVE your Crack the Classroom Code! Very creative and unique and a fantastic way to have students review specific skills. so much fun for review! Very thorough and my kids loved it. It took a little longer than anticipated. Great resource! The students loved this activity. It worked well in a whole class setting. So much fun! My students love this!!! Students loved this and we did it with our whole grade level during RTI! Thanks! Very fun! I did not have any students finish in 60 minutes however, so be sure to provide at least an hour and a half of time for this! I am beyond excited to share this with my students. It will be a great way to review main idea. Excited to try this with my 4th graders! We’ve done several online escape challenges but we are ready to physically try one in the classroom. I agree that the “main idea” is what I teach as a “topic…” I can definitely modify it to meet our needs though! Thanks for doing all the prep work for me! We had a blast with this resource. Great Work! Excited to do this with my students! This is a great activity. It was a little tedious and confusing to put together. Can’t wait to do this with my students!! Perfect!! This was our second Escape Room (purchased from you) and my students LOVED it! They were completely engaged the entire time! I like how you combine a skill with learning about other countries/artifacts/etc. Great way to review concepts while keeping students engaged. My class enjoyed finding new clues and solving mysteries. While strengthening their reading comprehension, they also learned about perseverance, teamwork, and the importance of paying attention to detail. There was a bit of prep, but once I got the hang of it, it was easy to set things up. I highly recommend this activity! Very in depth instructions! Thank you!! A great and valuable resource. This was an awesome support for my niece who is student teaching. Teachers Rock! So smart but paid so little. lots to print but they always love these! Very fun for the students. Looks great! Can’t wait to use it! I wasn’t able to use this resource because it taught Main Idea differently than I teach to my students. However, I do think it is a great resource and of high quality! It is obvious a lot of thought and effort went into this resource! Absolutely amazing resource! My students were so engaged and had so much fun! Great way to review and prep while keeping my kids calm and giving a chance to move around the room. Did this one with my 5th graders today. They loved it! I had 100 percent engagement. Great practice with main idea and details. We had never done one, but I had them do it in groups and they did great. Thank you! I’m using the escape room packets for “Fun Fridays” to help reinforce the week’s standards, yet give the kiddos a treat! This requires a lot of prep and paper. Once it’s completed, my students enjoyed it! I would have loved an answer sheet included in this unit. I did not see one for my students to write their answers and created one myself. VERY long – LOTS of pages to print, and a lot of work to put together, but fun once you do!